United States Citizenship and Immigration Services (“USCIS”), EB-5 Visa Program serves as a means to aid new, expanding* or troubled** U.S. businesses by providing an opportunity for international entrepreneurs to make equity investments in these businesses. Invest New Hampshire Regional Center was established to enable businesses throughout the state of New Hampshire to gain access to sought after capital while simultaneously forging long-lasting international partnerships. The international entrepreneurs, who become EB-5 Investors through the process, will receive a conditional “Green Card” when the investment is made. Conditions will be removed from the “Green Card” when requisite U.S. job creation resulting from their investment is proven. Invest New Hampshire Regional Center delivers guidance to businesses in all aspects of the EB-5 Visa Program, from business plans to marketing. 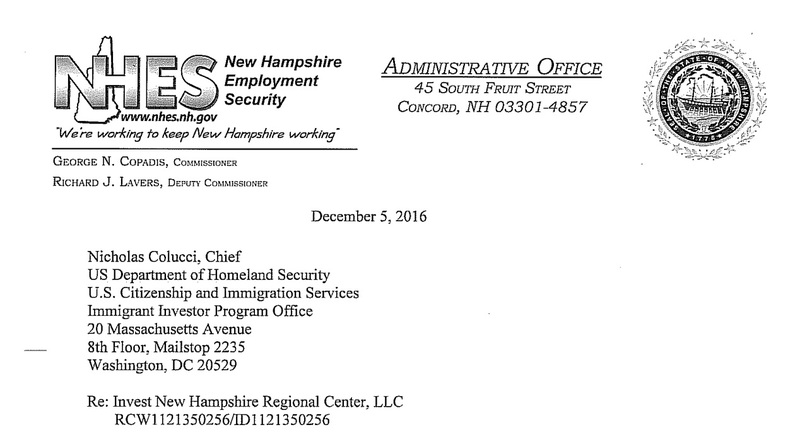 Furthermore, with job-creation a central requirement of the EB-5 Visa Program (see link above), Invest New Hampshire Regional Center provides the compliance mechanisms necessary to ensure businesses meet their commitments. 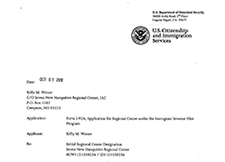 While not every business will meet the rigorous requirements of the EB-5 Visa Program, if you would like to learn more about the program and desire to become a business affiliate of Invest New Hampshire Regional Center, please contact us.